This is my third month participating in the Secret Recipe Club. If you haven’t checked it out yet, I highly recommend clicking on that little link there to see what its all about. You can view the previously posted recipes and sign up for the next month! Even before I was assigned a blog for this swap I already decided that I was going to challenge myself and not make a dessert this time. Not because I’m doing anything crazy like dieting again, but because my go-to choice on almost every blog I look at is the desserts section. I can’t help it. I try to look at recipes with chicken, beef, pasta or seafood but somehow my mouse scrolls down the page and ends up on chocolates, cakes, pies, cupcakes or whatever else. Hence the reason why I made Fruited Bran Muffins and a Croquembouche. I’m starting to think I have a bit of a desserts addiction. Or maybe just a really hungry sweet tooth. Anyway, I was given Dana’s Food for Thought as my blog this month. I immediately clicked on the Recipes tab and then selected the entrees. Then there was a bit of a pause. I’d have no problem eating any of the recipes on the list, but Tom is another story. He’s a bit picky. I debated on making a separate dish for him so I could pick anything I wanted. Then I realized I just couldn’t decide. Honey Garlic Chicken or Southwestern Turkey Burgers with Red Onion Marmalade? Portobella Mushroom Burgers with Red Pepper Relish or Sweet Potato and Caramelized Onion Quesadillas? 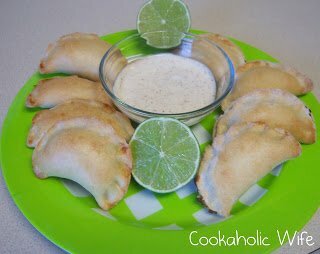 I’ll admit it, I started at that list of entrees on and off for a good week before finally deciding to make Lime Chicken Empanadas with Ranchero Ranch Dressing. Wanna know why I chose those? Its rather simple…I’ve never had an empanada before. From scratch empanadas stuffed with chicken, cheese and onion. 1. Add the chicken stock and lime juice to the crock pot. Sprinkle the chile powder over the chicken and place in the crock pot. 2. Cook on low for 4-6 hours or until cooked through. 3. Shred the chicken and transfer to a bowl. Drizzle 3 tablespoons of the juice from the crock pot over the chicken and set aside. 1. In a large bowl, combine the flour, salt and baking powder. Use your fingers to cut in the butter until the mixture is crumbly. 2. Add 1 cup of cold water and mix it just until the dough comes together. It should be tacky but not too tacky that you can’t work with it. 3. Lightly flour a surface and turn out the dough. Divide into two equal portions and knead each for 2 minutes, forming it into a smooth ball. 4. Lightly oil a bowl and place both balls of dough in it. Cover with plastic wrap and let rise for 20 minutes. 1. While the dough is rising, heat olive oil and sugar in a large skillet over low heat. 2. Add the onions to the skillet and cook for 25-30 minutes, stirring frequently or until the onions have caramelized. 3. Transfer the onions to the chicken mixture. Add in the goat cheese and stir until combined. Season with salt and pepper to taste. 1. Preheat the oven to 400 and line two large baking sheets with parchment paper. 2. Roll out each dough ball to 1/4″ thickness. Using a glass or circle cookie cutter, cut out 4-5″ circles. Place them on the prepared baking sheets. 3. Spoon 2 tablespoons of the chicken mixture into the center of each dough round. Fold the dough over to make a half moon shape and crimp the edges with your fingers or a fork. Repeat with remaining dough. 4. In a small bowl, which the egg and 1.5 tablespoons of water together. Brush the egg wash over the dough, being careful not to brush all the way to the crimped edge. 5. Bake the empanadas for 15 minutes, then rotate the baking sheet and bake for another 15 minutes. 1. While the empanadas are baking, mix together the dressing ingredients in a small bowl. Refrigerate until ready to serve. Since Tom doesn’t like any type of meat with a citrus flavor, I used one less lime than the recipe called for. I didn’t taste the lime juice at all, so if you’d like a strong lime flavor, I’d use all 3 limes and zest half of one and add it to the chicken mixture once its cooked. I ate mine with the ranch dressing and Tom had his with taco sauce. We both thought these were pretty tasty. Next time I think I’ll add red pepper and a little cayenne pepper to give them some more color and heat. I think these would be perfect as appetizers for a party or get together. Also – if you want to freeze some of the empanadas, Dana says to freeze them for 2 hours on a baking sheet after crimping the edges. Once they’re frozen, you can wrap them in plastic and transfer to freezer bags.